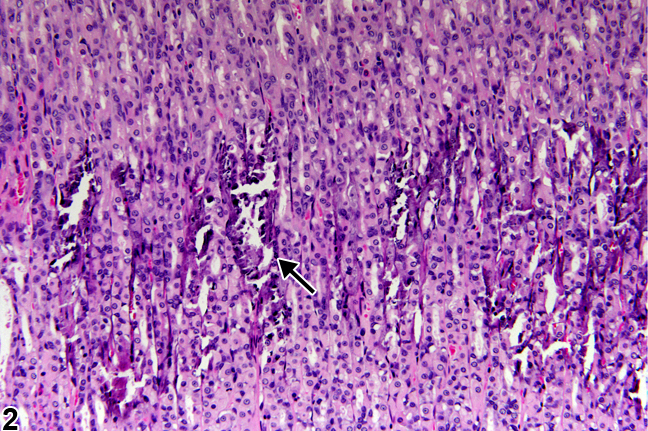 Stomach, Glandular stomach - Mineralization in a male F344/N rat from a chronic study. There is a linear band of mineralization paralleling the parietal rich region in gastric fundus (arrow). Stomach, Glandular stomach - Mineralization in a male F344/N rat from a chronic study (higher magnification of Figure 1). There is a linear band of mineralization paralleling the parietal rich region in gastric fundus (arrow). 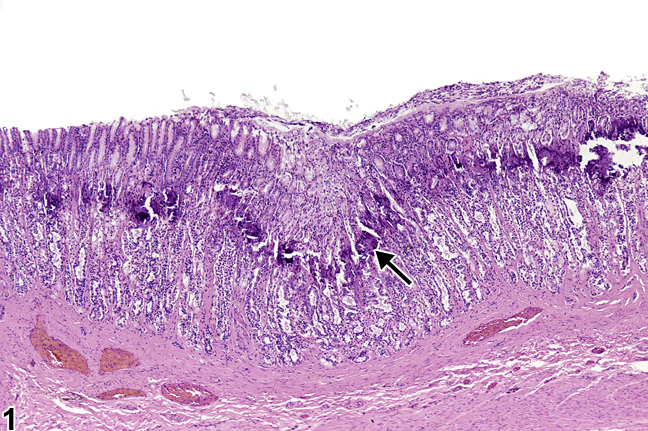 Mineralization characterized by focal aggregates or concretions of densely blue-staining mineral is fairly common in the H&E-stained sections from the stomachs of aged rats, where they are associated with cystic dilation of the gastric glands; mice and hamsters occasionally show similar changes. Gastric mineralization may become marked in rodents when there is disturbance in mineral metabolism, particularly with chronic progressive renal disease and uremia due to altered calcium-phosphorus metabolism and hyperparathyroidism. These changes are characterized by mineralization of the vessels throughout the gastric fundus, muscular tunics, and interstitium in a band paralleling the parietal-cell-rich region of the mucosa ( Figure 1 and Figure 2 , arrows) but not the cardia, antrum, or pylorus. Mineral deposits develop around basement membranes surrounding epithelium and blood vessels. The lamina propria becomes expanded by edema, and fibroplasia of the interstitium develops. 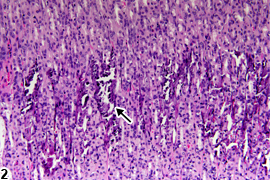 The gastric glands become dilated with swelling and degeneration of parietal cells and atrophy of chief cells. Erosion of the glandular epithelium with hemorrhage occurs. Gastric mineralization is frequently accompanied by mucous cell hyperplasia. Mineralization should be diagnosed and graded depending on the extent of mineralization. Associated lesions, such as inflammation or degeneration of gastric epithelial cells, that are secondary to the mineralization should not be diagnosed separately but should be described in the narrative. Newman SJ, Confer AW, Panciera RJ. 2007. Urinary system. In: Pathologic Basis of Veterinary Disease, 4th ed (McGavin MD, Zachary JF, eds). Mosby, St Louis, MO, 613-691.